Secretly I like to bake. 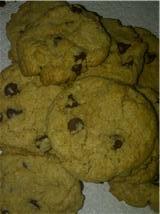 You saw I did pies and last night cookies. After I made my stew (pics below), I decided to make cookies. What I used is my 1-2-4-2 formula. 1=fat, 2=sugar. 4=flour, 2=liquid. The numbers equals parts. So depending on how much I want to make I could do 1 cup of butter, 2 cups of sugar, 4 cups of flour, and 2 cups of milk. Now this formula is for cakes but for cookies I leave out the liquid. I add a ½ teaspoon of baking powder and ¼ teaspoon of soda per cup of flour and use egg replacer; one egg equivalent for each cup of flour. I add vanilla for flavoring and a touch of salt. Now the trick is what flours, sweetener, and fat to use. I use spelt flour, organic cane juice crystals, and earth balance buttery spread. But you can use any flour but note that the denser the flour, i.e. whole wheat, spelt, you can use a liquid sweetener. Agave or maple syrup can work but haven't used rice syrup. Make sure you cream your fat and sugar together. Anyhoo, just play with this idea. One of the reasons I've become so obsessed with Southern Vegetarian cooking is that I became tired of flavorless food (especially cookies). Being vegetarian didn't mean I had to give up flavor. So my Southern Veg folks, don't give up the flavor you love from the south just because you changed your diet. I almost forgot my stew. It came out great! 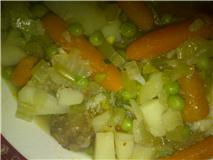 I used basic stew ingredients, potatoes, celery, onion, carrots, peas, and added aromatics from the garden (parsley and rosemary). 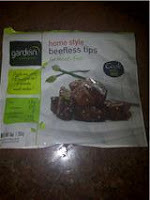 Then I added Gardein beefless tips (Target sells them). Not a bad substitute and worth a try if you like stews.